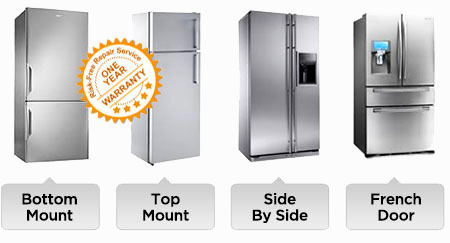 We at Refrigerator Repair Toronto specialize in servicing and repairing your home or commercial refrigeration unit. Our highly trained technical staff will inform you at every step of the repair process of what caused the issue and how it will be resolved. From Freon leaks to a leaky water valve, we cover it all and make your experience a stress free and seamless one. It is with our technical and professional devotion that we set up your appointment with extreme urgency and speediness. At Toronto Appliance Repair, we know how difficult it is to continue on a daily basis without a working and properly functioning refrigerator. And this is exactly why we have focused our training and expertise on very thorough refrigerator and freezer repair diagnostic techniques and resolution. We repair and service all major brands of refrigeration units, from your common home appliance to commercial stand up and under the counter varieties. We have four major types of refrigerators today, which include: bottom mount refrigerators, top mount refrigerator, side-by-side refrigerators and French-door refrigerators. The obvious main difference between them is the layout of the doors and the location of the freezer. Our Toronto Refrigeration & Appliances technicians are knowledgeable in repair of these all types of refrigerators.